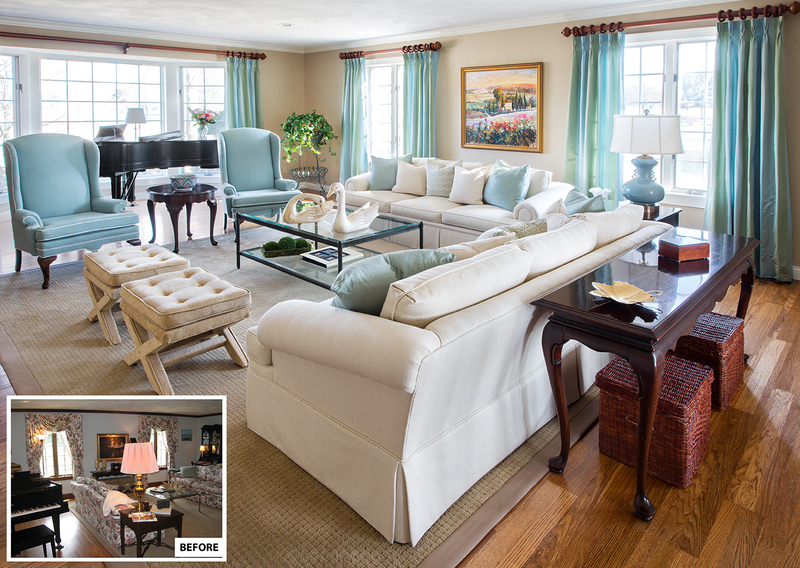 From floral to fab, a few thoughtful, eco-conscious updates transformed this typical '80s living room into a cheerful space boasting understated elegance that jives perfectly with the surrounding Illinois countryside. When designer Caryn Burstein Babich of Arcterior Design came on board, the homeowners showed her a picture of a bright room with soft, elegant finishes and blue tones. Problem was, the original space was “dark and on the heavy side,” as Babich puts it. The designer knew she needed more light, so she played with color and contrast. Initially, the room had achromatic walls and colorful, albeit faded, furniture. “I reversed that, adding color to the walls and making the furniture more mild,” Babich says, pointing to the Benjamin Moore shaker beige paint, which softens the space as creamy, off-white accents add depth without any of the sterility you might get from a starker white. “The room had great bones and great window space, but it was covered by heavy window treatments,” Babich continues. The next step was removing the curtains and sheers and tinting the windows, which offered an al-fresco ambience while protecting interior fabrics; new blue-silk drapes surround the windows without hiding them. As a finishing touch, Babich recommended can lighting and purchased the homeowners' favorite illuminated addition: a blue lamp from Brody’s. The original floral sofas were dated, true, but the craftsmanship was top-notch. That’s why the homeowners reupholstered them, opting for a solid, off-white fabric with the intention of adding flair via simple throw pillows. Another eco-smart, budget-friendly idea was revitalizing the old Ethan Allen cabinet with some fresh paint. Salvaging furniture is all well and good, but it is also fun to splurge. With the goal of keeping things airy, Babich added a wrought-iron and glass coffee table that’s interesting but doesn’t overpower the built-in bookcases – a new addition functioning as a focal point and offering an organized, more finished look. When the furniture was ready, Babich rearranged it into a more welcoming configuration that supports the new space’s open vibe. The homeowners were reserved throughout the design process and thoughtful about changes. “And that’s so great because I knew they’d love the end result,” says Babich.